To see our club propaganda click here. When I was four years old I went to Germany with my mother. One day we went walking through a forest and we came to a clearing between the trees. A glider was being launched by a winch. 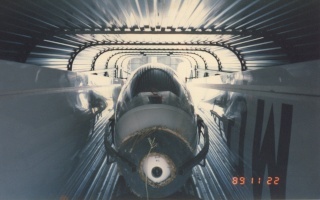 At the top of the launch the cable was released and it fell to earth with a drogue chute attached. Mum not understanding what was happened explained that a man had jumped out wearing a parachute. Me, being four, believed her and it wasn't till I was 27 that I realized her mistake. At twelve I saw a disney movie called "The boy who flew with the condors" or something like that. A story about a boy who was watching condors when a beautiful girl landed a glider in a nearby field. He was converted and became a glider pilot himself. I fantasized about gliding on and off till I was 27. Then I read Richard Bach's "Bridge across forever" where his wife Leslie Parish was learning to glide. I thought it was time I did something about this or I'd never get around to it. Two months later I'd joined a club and six months later I was a solo rated glider pilot. 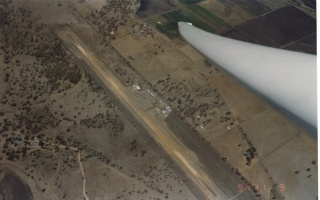 The club I joined was (and still is) - The Southern Downs Areo and Soaring club - the SDASC. This is a photo of the air-field. It's at Massie near the town of Warwick in south-east Queensland, Australia. It's a medium sized club (about 80 members) which draws much of its membership from Brisbane which is about 150 klm away. The country is flat farmland and has fairly good gliding conditions most of the year. 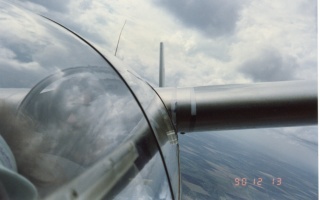 My basic training was all done in Blanik-L13s, the club owned three at the time when I was learning to fly. This is what the outside of a blanik looks like at 6000 feet. Yes we still measure heights in feet here and speed in knots but distance is in kilometers - very strange. The blanik is a very nice glider to fly, unfortunately we've been phasing them out in favour of new gliders. They are a low performance glider by modern standards but we still managed some reasonable cross country flights in them. 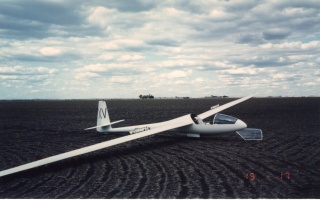 Your first solo flights are flown in the same type of glider you learned to fly in, but after you gain experience you are converted to higher performance single seaters. Inititially you fly locally, this means you are always close enough to be able to land back at the airfield. As you progress you generally are trained to land away from the airfield, usually in ploughed paddocks. This is the club Hornet, this was the club x-country single seater, now there are sometimes other x-country gliders available to members. 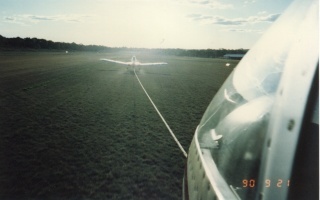 Our club operates using a pawnee 235 (x crop-duster) as tow plane. 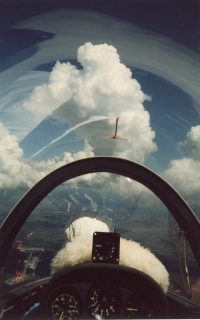 Gliders are relatively boring unless given some altitude. This is usually done using a tow plane, winch or (rarely) an auto-tow ,ie a car tow. Here the glider has just lifted off the ground and we're waiting for the tug to lift off as well. Once we release from the tow (usually somewhere between 1000' and 2000' above ground), we try to find rising air, usually a thermal (lift) and we let it carry us higher. Thermal's can take us to 10,000 feet or so on a good day and other forms of lift can go much higher. Clouds often show us where the thermals are, we're cruising towards a good looking cloud in the photo on the left. 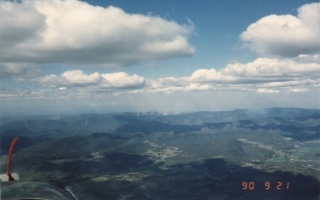 The photo on the right shows the main range (great dividing range) which is to the east of Massie. For long distance flights we usually we fly north-west to avoid the mountains and restricted air spaces. But we sometimes take shorter scenic flights to the east and south. This is one of those paddocks I told you about, they can be kilometers across and often the farm houses are empty. Fortunately the mobile phone and the GPS now makes finding an outlanded glider easier than it used to be. The glider can be de-rigged, ie the wings etc can be taken off. Sometime the glider can be aero-towed out of the paddock this is not always practical and it's usually expensive. This is where we put the gliders when they've been bad - such as when they've landed in a paddock. We put then in these dark boxes and leave them there to consider their sins while we tow them home and sometimes even longer. This one was so bad it had to be muzzled as well. 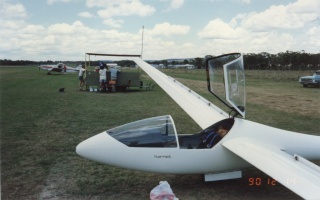 Many pilots choose to own their own gliders. Due to the expense of both purchase and maintenance, forming a syndicate is often more practical than owning one all by yourself. I own a 1/4 share in this glider, it's far from state of art but it's a very nice plane to fly. I'm not flying it enough at the moment but I hope to change that soon.